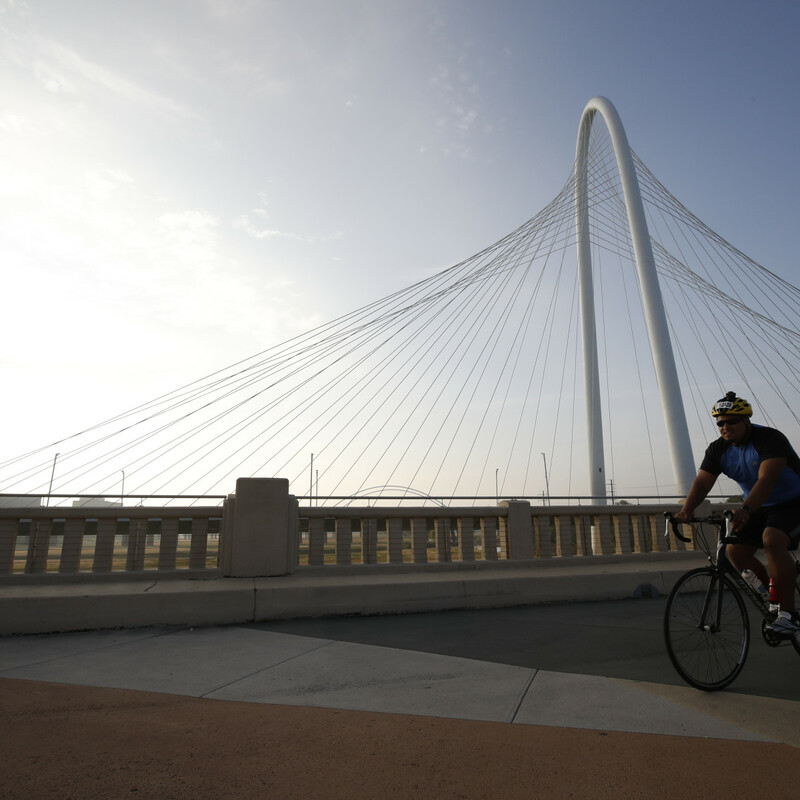 It's nearly fall, and that also means it's nearly time for the Dallas Bike Ride. The annual event returns for its second year on November 3, giving cyclists and outdoor enthusiasts the chance to pedal a 20-mile, car-free course around Big D.
In addition to the fun Finish Festival, at which Lone Star Attitude is headlining, the course is also studded with mariachi bands, local favorite Richmond Punch, the NBA Mavs Drum Line, the Red Bull MXT DJ Vehicle, and more. A free yoga class, a health and wellness zone, a kids' area, and plenty of local food and beverage options also await. 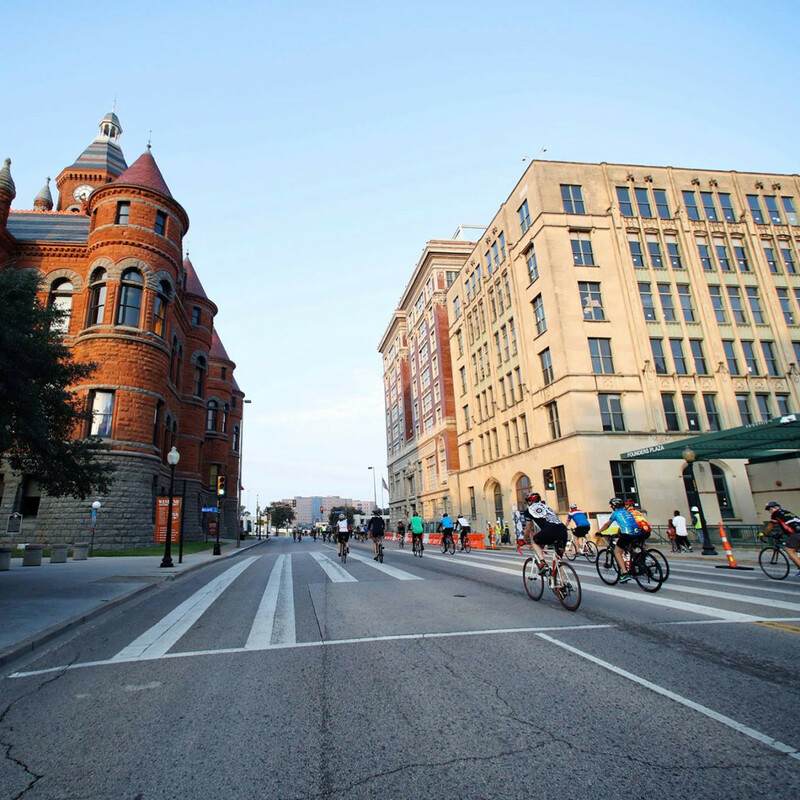 The ride begins and ends at City Hall Plaza, and from there you'll pass by Belo Garden, Dealey Plaza, the Old Red Museum, and the John Fitzgerald Kennedy Memorial. Don't forget to look up from time to time and admire the surrounding historic buildings. Along Broome Street and heading toward Olive, you'll pedal past the distinctive silver facade of the Perot Museum of Nature and Science. Moving from Olive Street onto Flora, the green expanse of Klyde Warren Park will be waiting. Continue on through the largest arts district in the country, and you'll pass the ruby-red Winspear Opera House and the silver, striated Wyly Theatre, along with the Morton H. Meyerson Symphony Center and Booker T. Washington High School for the Performing and Visual Arts. Give a little wave to Stuart Kraft's 27-foot-tall Pegasus sculpture if you can. As you transition into Uptown, you'll ride by the elegant Crescent Court and down a stretch of Cedar Springs Road that's famous for its nightlife. A slight detour along Turtle Creek also crosses the Katy Trail before heading back down to Reverchon Park. 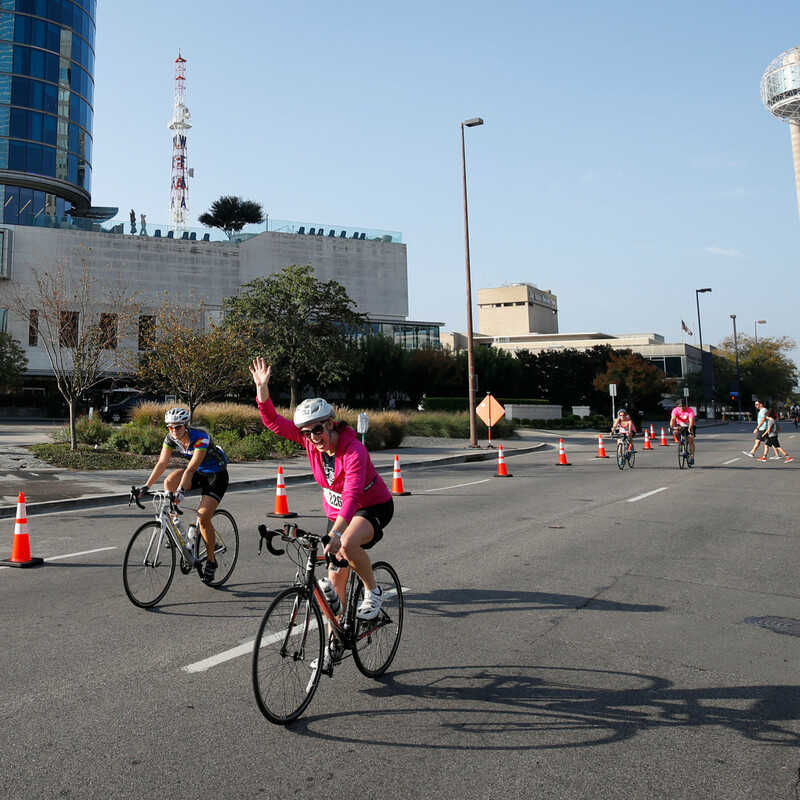 Cross under the Dallas North Tollway and you're at the Design District, riding past well-known restaurants such as Meddlesome Moth, Ascension Coffee, Wheelhouse, and Sasseta. Turning right onto Irving Boulevard takes you past the galleries and showrooms that give the area its name. Hook a left on Sylvan Avenue and then make sure to look to your left, where a stunning view of the downtown Dallas skyline will reveal itself as you cross the Trinity River. 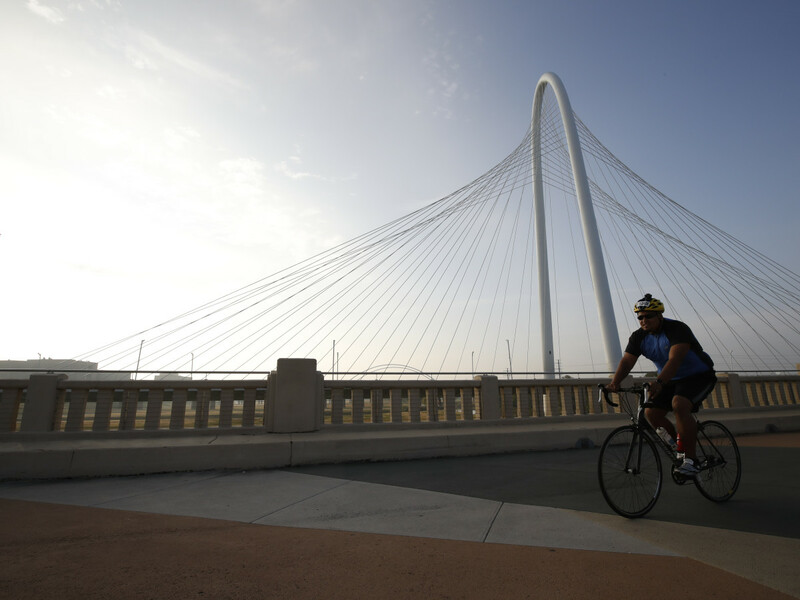 Catch a glimpse of Trinity Groves before peddling along the Ronald Kirk Pedestrian Bridge (formerly the Continental Avenue Bridge) — be sure to marvel at the Margaret Hunt Hill rising up on your right. Loop back around the cross the Trinity again via Commerce Street. Sylvan Thirty and the historic Belmont Hotel mark the entrance to Oak Cliff, which quickly transitions into the peaceful, stately neighborhood of Kessler. 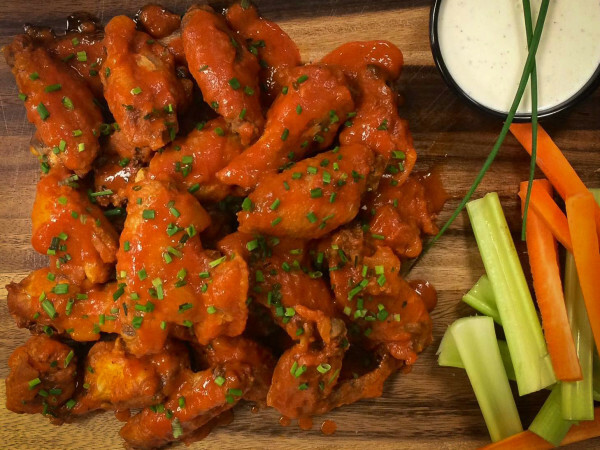 After passing by the massive Methodist Health building, you're on your way toward the Bishop Arts District and Jefferson Boulevard, where the infamous Texas Theatre is located. You'll stay on Jefferson all the way back to downtown and City Hall Plaza, where hundreds of supporters will be waiting at the finish line. 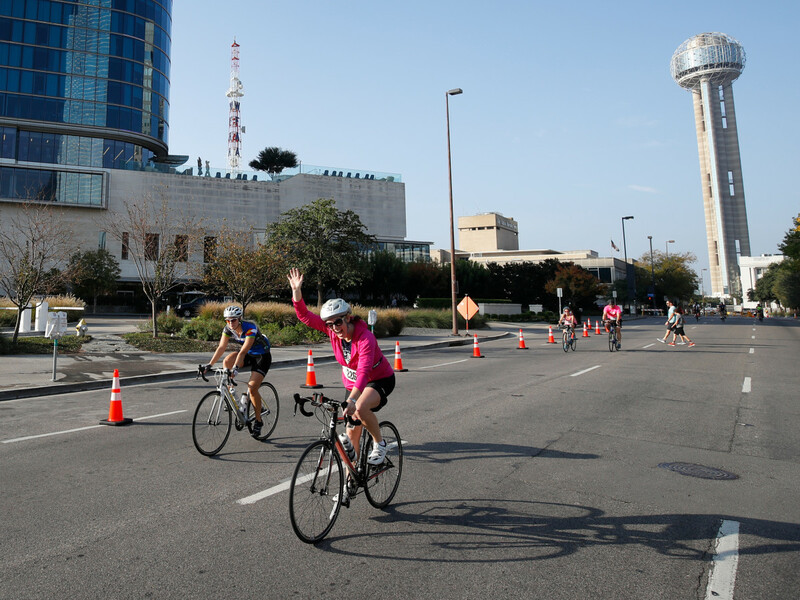 Bicyclists of all ages (3 and up) and abilities are welcome, and this year's Dallas Bike Ride is partnering with BikeDFW as its beneficiary. 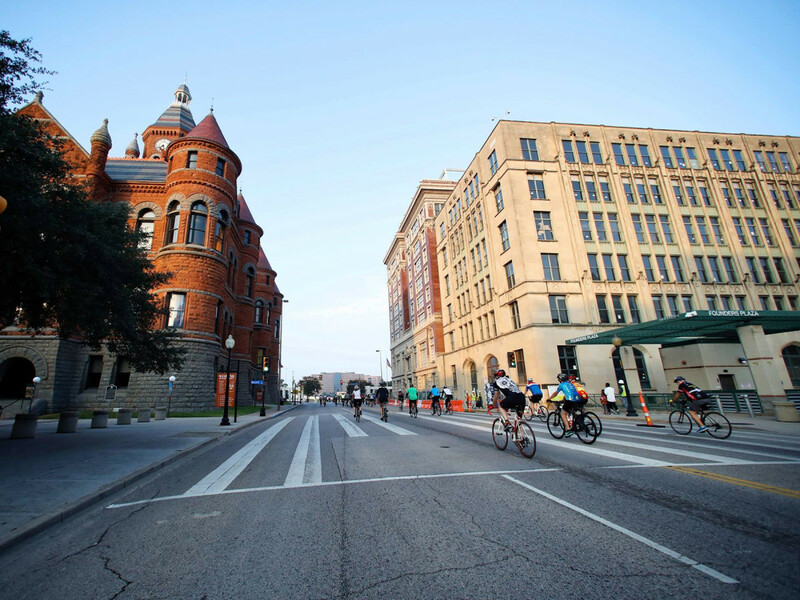 BikeDFW educates, supports, and promotes the safe use of bicycles as an affordable, viable, and sustainable means of active transportation and personal enjoyment within the Dallas-Fort Worth community. Registration is now open, so sign up today.